You probably already noticed: Google has no longer always provided the search terms visitors used to get to your site. Given the change in the analytics landscape since the dreaded launch of keyword “Not provided”, the question has to be asked: How does one work with imperfect information? Before we answer that, let’s discuss exactly what keyword “Not Provided” actually is. What is it? Starting with the change of policy in October 2011, Google has announced that any search performed by a user logged into a Google account will no longer be recorded in Analytics. Instead that search term will now begin showing up as keyword: “not provided”. this Santa Cruz CA Hotel. What Should I Expect? 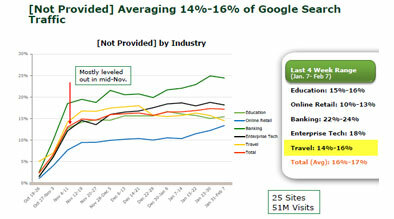 While Google has noted that the “not provided” keyword levels should not affect more than 10% of all users, a research conducted by panel presenter Nathan Safran has shown that the “not provided” keyword growth within the Travel industry could range anywhere from 14-16% of all keyword traffic. 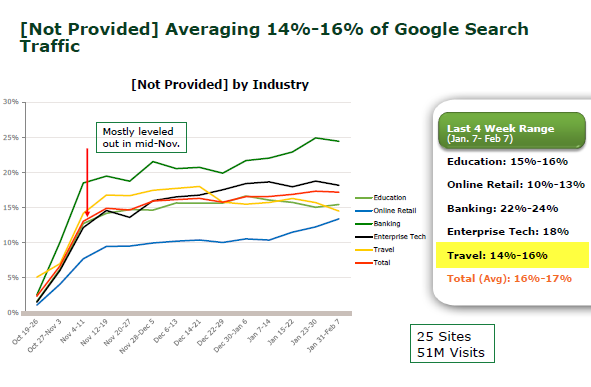 Figure 2: Info graph explaining keyword “not provided” growth rate since October 2011. Info graph courtesy Nathan Safran at Conductor. Should I be worried about this missing data? Simply put – not at all. It is important to note that there is actually little difference in terms of onsite behavior for users who may be logged into their Google account versus those who may not be logged in. While you may have access to a fractionally smaller sample size, the actual data itself should not be affected. What Should I Do? First of all, it is important to note that this is in no way the end of the world! SEO has forever been known as a moving target, and this is simply another step in the evolution of the industry. That being said there are at least three key takeaways for you to consider with the launch of keyword “not provided”. Experiment with PPC: If you really want to know exactly how your keywords may be performing, try experimenting with PPC. In fact testing PPC before building out the rest of your website can provide you with immediate insight into which areas of your optimization are set to work and what other areas may be doomed to fail. Understand New SEO Metrics: Building off the last point – begin incorporating some analytical aspects of your PPC campaign into your SEO strategy. Do not think of a successfully website simply in terms of “visits” or “pageviews” but think more so about “Quality Score” and the overall performance of your site. These days, “Time Spent on Site”, “Bounce Rate”, and “Average Page Views” are all excellent measures of a website’s quality score. Test your SEO Strategy: As previously mentioned, your SEO strategy is never set in stone, and much like you perform A/B testing with your PPC campaign you should also be experimenting with your SEO strategy. Perform minor updated to the optimization of your site by testing Meta data, H1, H2, anchor text and note what works and what doesn’t. At the very least you are providing your site with fresh content on a regular basis. 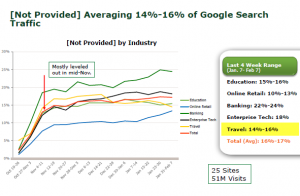 Overall, marketers should focus more on page relevancy, long tail keywords, and segmentation. By looking at the big picture, “conversion” really is the key of successful campaign!